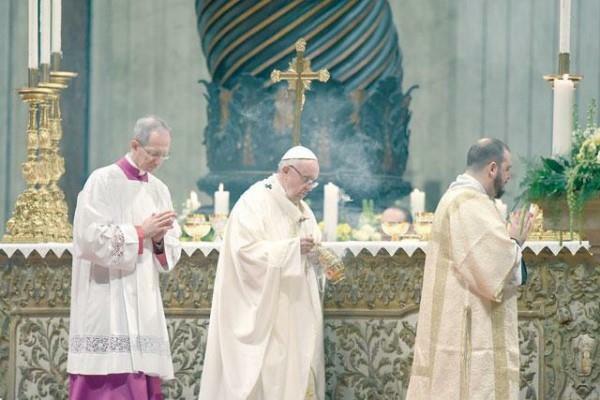 (MENAFN - Jordan Times) VATICAN CITY/ABU DHABI — Pope Francis is hoping to persuade a country enmeshed in a regional war that he has condemned to give Catholics more freedom when he becomes the first Pontiff to set foot on the Arabian Peninsula. Francis will spend less than 48 hours in the United Arab Emirates, which is fighting alongside Saudi Arabia in theYemenwar, and is due to make only two public addresses during the trip that starts on Sunday night. Although short, the visit to the peninsula, home to 2 million expatriate Catholics as well as the holiest sites of Islam in Saudi Arabia, is a landmark one. The freedom to practice Christianity — or any religion other than Islam — varies across Gulf countries. 'I am happy for this occasion the Lord has given me to write, on your dear land, a new page in the history of relations between religions,' Francis said in a video message on Thursday. It started in Arabic with the words Al Salamu Alaikum (Peace be with you). Priests, worshippers and diplomats in the UAE, where there are nearly 1 million Catholics, say it is among the most tolerant countries in the Gulf region towards other religions. Francis praised the UAE as 'a land that is trying to be a model of coexistence, of human brotherhood, and a meeting place among diverse civilisations and cultures'. The war inYemen, which the Pope has condemned several times, could cast a shadow on the trip. Last June, he said he was following the 'dramatic fate of the people ofYemen, already exhausted by years of conflict' and appealed to the international community to seek negotiations 'to avoid a worsening of the already tragic humanitarian situation'. The UAE has played a leading role in the Saudi-led coalition waging a nearly four-year war against the Iran-aligned Houthi movement inYemen. Rights groups have accused UAE-backed forces of torturing detainees in areas under their control inYemen, charges the UAE has denied. The UAE says it has never run prisons or secret detention centers inYemenand that prisons there are under the authority of theYemeni government. ItsYemeni allies have denied allegations of torturing prisoners. 'I don't think the Pope will be silent about what is happening in the region,' Bishop Paul Hinder, the Abu Dhabi-based Apostolic Vicar for Southern Arabia, said in an interview when asked if the Pope would speak about the war. Hinder, and Vatican spokesman Alessandro Gisotti, said they did not know if the Pope would mention it in public, or in private meetings with the UAE leaders. "The Pope has spoken out about the suffering of the people ofYemenwhile many others have remained silent," Gisotti told reporters on Friday, without saying to whom he was referring. The Pope will meet privately with Sheikh Mohammed Bin Zayed Al Nahyan, crown prince of Abu Dhabi, who invited him. 'There may very well be some people who will criticise him for going [because of the war inYemen] but I expect that he will raise this issue as he has previously," a Western diplomat said. Vatican officials call Catholic communities such as those in the UAE 'passport churches' because the priests, like the mostly Philippine and Indian Catholics they minister to, are foreign and need permission to live and work there. 'We are really stretched. We need more churches. We need more priests,' one official said.